The Reformed Church was established in France by the mid-1530s. 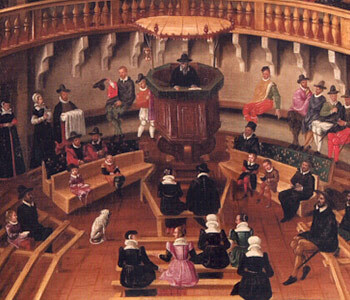 French Protestants were influenced by Martin Luther’s preaching and later established a reformed church following the teachings of John Calvin. Protestant theologians such as Calvin taught that a universal priesthood of believers could find salvation not through the interventions of a church, but through individual faith alone. The Bible was translated for the first time into the vernacular languages and the new faith was based on the study and individual interpretation of the Bible. From the 1530s to 1560, the French Protestant Church experienced a period of rapid growth. The Huguenots had their own churches, schools, garrisoned towns, manned castles and fortifications. As the Protestant Church grew, conflict with the Roman Catholic Church and the Crown intensified and the first religious refugees began to leave France. 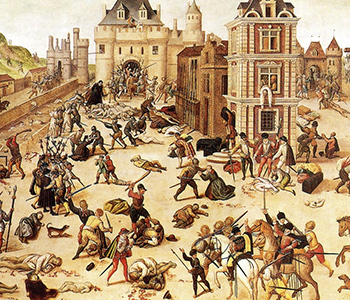 In March 1562 a group of unarmed Huguenots who were worshipping in a barn at Vassy were attacked by royal troops and over one hundred were killed. The massacre at Vassy began the Wars of Religion which would tear France apart for the next thirty-five years. 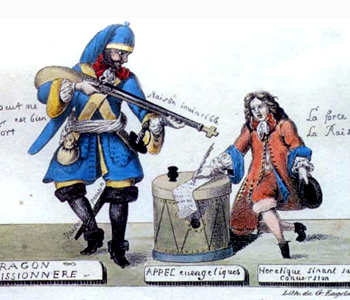 During this period there was constant civil unrest and fighting between French Catholics and the Protestants, who were also called Huguenots, réligionnaires or “members of the so-called Reformed Religion.” The main rivalry centered on conflicts between the French nobility in the House of Bourbon and the House of Guise (Lorraine). Gaspard de Coligny, Admiral of the French Navy, became a leader and spokesman for the Protestant cause. Upheaval in France led him to organize an expedition to establish a home for the Huguenots in the new world. In 1562, he sent Jean Ribaut and a small group of Huguenots to establish a short-lived settlement called Charlesfort at what is today known as Parris Island, South Carolina. 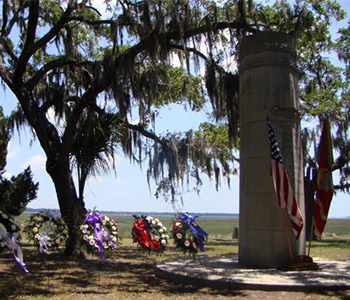 Three years later Ribaut was killed at Fort Caroline in Florida when it was attacked by Spanish forces who also killed its founder René de Laudonnière and several hundred French Protestant settlers. In August 1572, Prince Henri de Navarre, a Protestant, was to marry Marguerite de Valois, sister of Charles IX, in Paris. 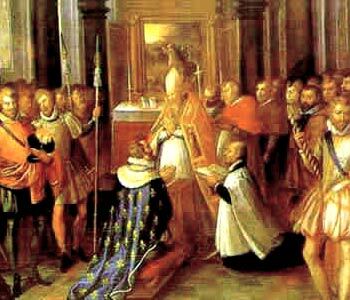 The Roman Catholic leaders, together with the Regent, took this as an opportunity to assassinate Coligny and many of the Protestants who were in Paris for the wedding. During the night of August 23, 1572, those plans were carried out. When young King Charles IX was pressed to agree to the plan, he was reputed to have ordered “the death of all the Protestants of France, so that none would remain to reproach him later.” Coligny was murdered and the frenzy spread through Paris and throughout the provinces, resulting in the deaths of an estimated three thousand men, women and children in three days. This has become known as the St. Bartholomew’s Day Massacre. Henri de Navarre, born a Catholic in the House of Bourbon, converted to Protestantism and narrowly escaped assassination during the St. Bartholomew’s Day Massacre. He led the Protestants in battle against the royal army of France throughout the Wars of Religion. After the death of Henri III in 1589, Henri de Navarre was crowned King Henri IV of France. When he ascended the throne of France in 1589, he abjured his Protestant faith, saying “Paris is worth a mass.” Although he converted to Catholicism for political reasons, he established basic rights for the Protestants. Ten years after he became King of France, Henry IV signed the Edict of Nantes in an attempt to promote civil unity. The Edict granted freedom of conscience to all French citizens and reinstated the civil rights of the French Protestants. It formally marked the end of the Wars of Religion, although hostility towards the Protestants continued during the coming century. Hostility increased after the 14 May 1610 assassination of Henry IV at the hands of Ravaillac, a Catholic fanatic. After Henri IV was assassinated in 1610, the Protestants lost much of their protection. The rise of the absolute monarchy began with Henry IV’s son and successor, Louis XIII, who regarded the Protestants as a threat to the monarchy and who was obsessed with eliminating the Protestant faith. 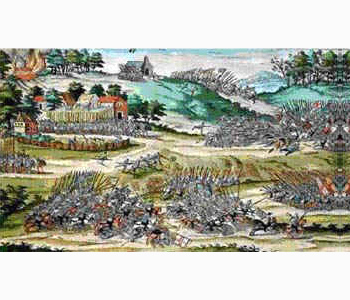 Protestant freedoms were restricted and, in 1622, the Crown began the first of three Huguenot Wars that ended in 1627 with the siege and fall of La Rochelle and an uneasy peace. Louis XIV, who ascended the throne in 1643, believed that there should be “one king, one law and one religion” in France. By 1665, Protestant churches and schools were being abolished and more restrictions were gradually imposed. Protestant men and women were imprisoned and their children kidnapped or forcibly removed and sent to orphanages and convents to be raised in the Roman Catholic faith. Between 1681 and 1686 royal troops (dragonnades) were forcibly quartered with Protestant families in several provinces in order to compel them to renounce their faith. Prior to the Revocation, there were about eight hundred thousand Huguenots in France. After years of persecution, approximately five hundred and fifty thousand of them recanted, or abjured, their faith. During the next twenty years, it is estimated that about a quarter of a million Protestants left France. Many fled to friendly neighboring countries such as Switzerland, Germany, the Netherlands and parts of Belgium. Others escaped to England, Scotland and Ireland from where they embarked for the West Indies and British North America, especially to the Carolinas, Virginia, New York and New England. Some also emigrated to South Africa and South America. The word refuge was used during this time to refer to the Protestant immigrants and their escape to countries offering them safety was known as Le Réfuge. 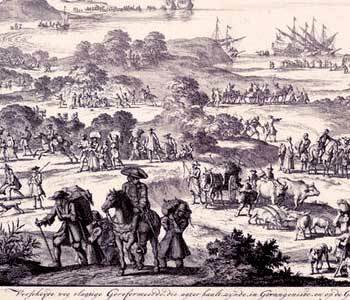 It is estimated that about 1,000 adult French Protestants fled to the British colonies before 1700. In 1628, French Protestants arrived in New Amsterdam. New Paltz was founded in 1677 and ten years later l’Eglise Française à la Nouvelle York was built. In 1680, the Richmond brought the first group of French Protestants to Carolina, followed in 1685 by the Margaret and several other ships in the following years. A number of Huguenots settled in Cape May, New Jersey in 1687. In 1700, Manakin Towne in Virginia was founded by Huguenot refugees. In addition, there were Huguenot immigrants in Narragansett, Rhode Island, Boston, Massachusetts, and other towns in the New World. The Huguenot refugees who left France were generally merchants, artisans, craftsmen, weavers or were skilled in specific trades. Many were well-educated, and some were able to establish new roles as entrepreneurs or professionals where they settled. They were generally well-received where they located and became industrious members of their new communities. Many of the French Protestant refugees had to learn new skills to support themselves and their families, becoming planters and traders, learning new languages and customs, and gradually becoming part of their new communities, while retaining their strong faith. These immigrants and their descendants played significant roles in the history of their adopted countries. In the mid-nineteenth century, there was a renewed interested in Huguenot history and genealogy. 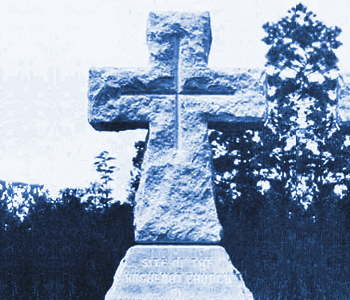 The Huguenot cross came into general use as a symbol of French Protestant ancestry, as did the term Huguenot. 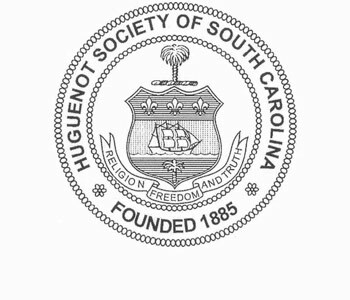 A number of lineage societies, including the Huguenot Society of South Carolina, were founded to preserve the history of the Huguenots and to promote a better understanding of their principles and values.